Since this is the starter post, be warned that this will be where the next writer answers their 10 or more questions. 5. Well you get the drift ;). For the next author- replace 'Starter Post' with your name please. This Interview thread was designed by the founder of Where Writers And Authors Meet Facebook Group and Extension Website. It was designed to help introduce the world to our group writers and authors as well as any other writers and authors we know. For those who have been tagged below please answer the following questions and find out what to do with your answers HERE. Thank you for participating and if you think you would rather not participate please alert the one who tagged you so they can pick someone else ;). 1. Tell us a little about what you write. 2. I see that you are about to have your first book published. Would you tell us a little about your publisher or how you found them? 3. Tell us about what inspires you to write. 4. If you get stuck in a place in your writing, what do you do to get yourself unstuck and back to writing again? 6. Where did you come up with the idea for your book? 8. Do you prefer to outline your story before you write it or do you just freewrite it as it comes to you? 9. What is one thing that you would like to be able to do in your lifetime? 10.Where can your fans find you? If you tag more than one person list their name and questions after you list your first person's questions. 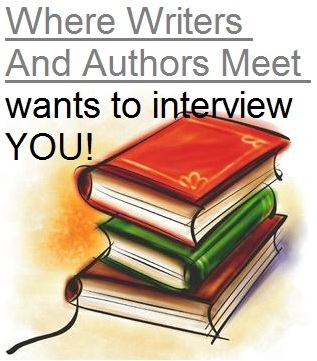 Thanks for letting Where Writers And Authors Meet interview you! Have a great day!